In celebration of their recently announced 2019 North American MOVING ON! Tour, The Who have launched a series of pop up Magic Buses straight from the 60s in Chicago, Los Angeles and New York City. The buses are inspired by The Who’s iconic song Magic Bus and compilation album, Magic Bus – The Who On Tour from 1968. Fans in Los Angeles can see the double-decker buses now through February 10th as they hit the streets from Santa Monica to Hollywood and over to Downtown L.A… View a full map of the buses’ routes. 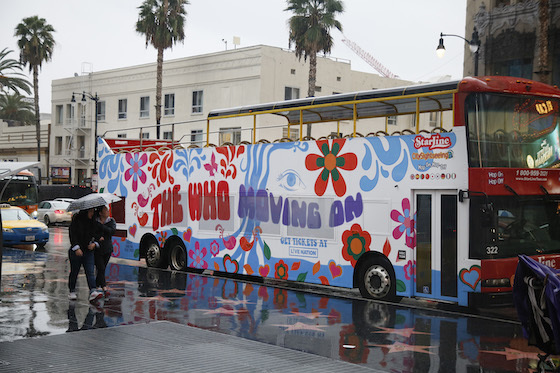 Fans who spot the bus can also enter a sweepstakes for a chance to win two premium tickets to The Who’s tour stop nearest to them. To enter, fans can post a picture of the bus on Instagram or Twitter using the hashtag #MagicBusEntry and follow + tag @LiveNation in the image. See rules for alternate method of entry. Sweepstakes ends Feb 10, 2019 at 11:59pm PST. The Who will also be releasing their first album of new songs in thirteen years later this year. On stage, the line-up will be rounded out by familiar Who players featuring guitarist/backup singer Simon Townshend, keyboardist Loren Gold, bassist Jon Button, and drummer Zak Starkey, and complemented by some of the best orchestras in the U.S. and Canada. The tour is their first return to the states since their 2017 Las Vegas residency. That same year they did a limited run of shows following 2016’s rescheduled leg of their acclaimed 50th-anniversary celebration. The band also drew praise for their extended 2012-2013 North American run, a 36 city Quadrophenia tour with the band performing their 1973 rock opera in its entirety.